While we wait for the architects to complete the Developmental Designs, there isn’t much to tell you beyond this: THE ELEVATOR IS NOW WORKING BEAUTIFULLY!! Thank you all for your patience during this long, long year. Also, while the deliverIt system is working itself out, we still need to be prepared for longer-than-we-were-used-to waits for items to come from other libraries. Hopefully, this will become a smoothly operating system as time goes on. 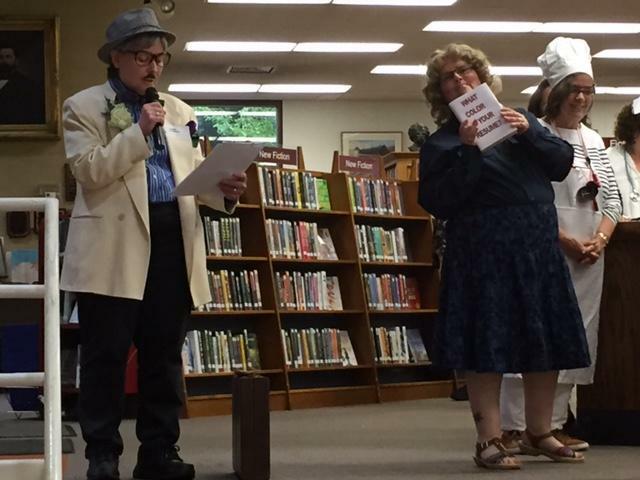 Did you come to the Murder Mystery Party on July 14th? I hope you had as much fun as we did! 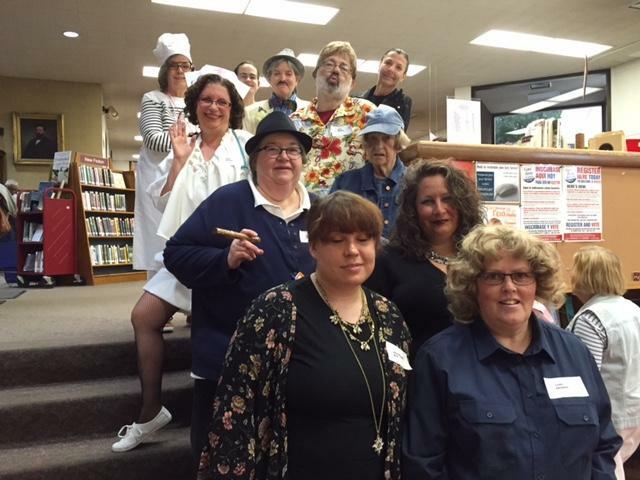 We have such a great staff, willing to be silly, dress up, and be totally different people for an evening. We have some great friends and spouses, as well, who pitched in to make it a wonderful evening. My only complaint about the whole evening was that I was the murderee, which meant I had nothing to do once I was dead… and I was having such fun being a gigolo!! 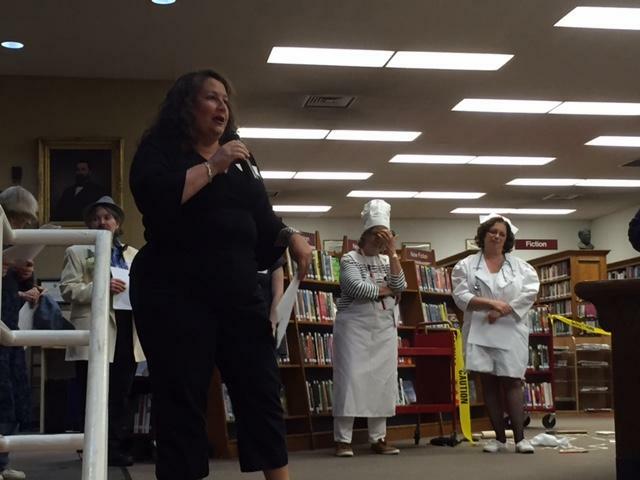 Here are a few pictures that will surprise those of you who had to miss the evening! This article might better be entitled ‘Timesavers,’ but time is money, right? We’ll start with the direct money savers, though, just to be consistent. Some of you already know about Zinio, but, in case you missed it, we offer free online magazines that you can read on your device or on your computer. We subscribe to over 50 different titles, which include “The Week”, “Women’s World”, “Golf”, “Rolling Stone”, “Us”, and many others! There are back issues and some children’s titles available as well. You can see the full list here, but the app you will want for your device is called RBdigital. If you are new to Zinio, but have used RBdigital for ebooks and audiobooks, make sure you read the following article on the new app by Peggy Ganong. Now, for the time-is-money part: Have a teenager approaching driving age or maybe you know an adult who needs to get their license? While we can’t save you the price of the Driver’s Ed course required by the State of CT for your 16 year old, we CAN help out with preparation and save YOU from having to quiz the student! We have online practice tests for the permit test, the license test, motorcycles, CDL, as well as all the handbooks. Calm test jitters by practicing in the comfort of home or at the library. Just go to CT-Drivers Ed. En espanol, así como. Know someone just starting out who needs some basic financial education, like how to buy insurance, how to balance a checkbook, how to start a 401K? We have a new series of books, (also available to read online) called Financial Literacy Basics (just scroll down). This series outlines step-by-step, how to make the most of your money, which pitfalls to avoid, and gives you the necessary tools to make sure you are fully equipped to manage your finances. 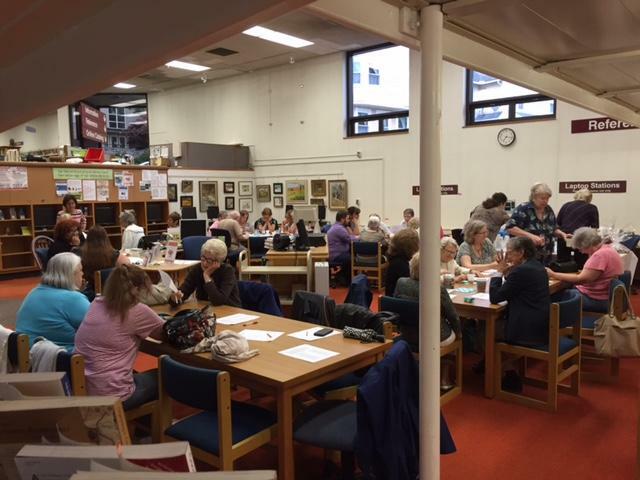 The website also includes a Medicare Prescription Primer, a tool for planning long term care insurance, and a tool for estimating how much auto or homeowner’s insurance is needed, for those in a different life situation. Take a look and see if the print or online version for you. Did you know we have a copier ($.15 B&W, $.25 color), a fax machine ($1.00/page), a scanner to email documents (free! ), a disc cleaner to make those DVDs or games like new ($.50/disc), and a notary available every weekend starting in September ($5.00/one page, $3.00 for each additional)? If you are already in town, and need those services, why not save yourself from making another trip? We are pleased to announce the new RBdigital app. 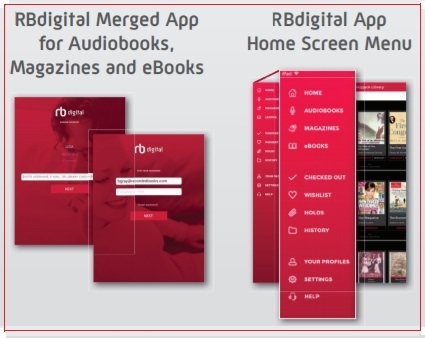 This new RBdigital app combines the OneClickdigital audiobook/eBook app with the Zinio for Libraries Magazine app so now you can access audiobooks, eBooks, and magazines all in a single app! Existing OneClickdigital app users have been notified through their OneClickdigital app to upgrade to the new RBdigital app. Existing Zinio for Libraries app users have been notified to install the new RBdigital app. 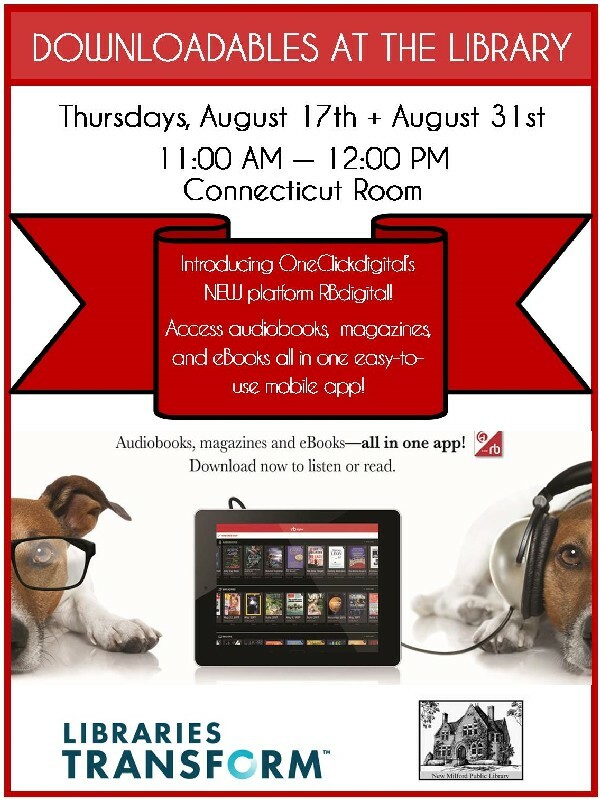 Both the OneClickdigital app and the Zinio for Libraries app will be available through mid-September to help with the transition to the new app. If you have not yet installed the OneClickdigital and Zinio apps on your device, then download them both and follow the directions below to set up your dual profile. Because of the way our subscriptions are structured, you will have to toggle between your profile for New Milford Library (for audio books and eBooks) and your Zinio profile (for magazines) when you wish to view the different collections and to download your selections. Click here for instructions on how to set up your 2 profiles. You can also check out answers to frequently asked questions. 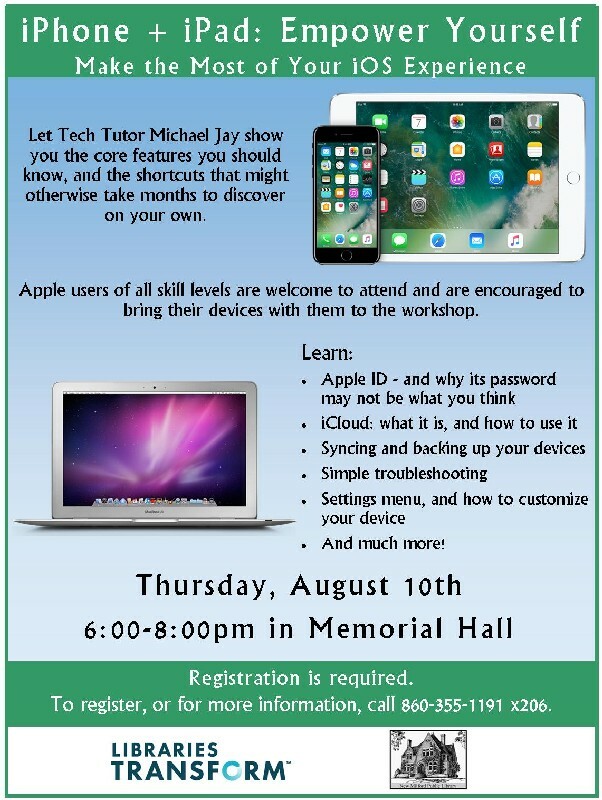 For help with this change in service, you may also attend one of the 2 programs (see below) being conducted by Rachael Schuster. support directly or call 860-355-1191 x206. Talking to you is one of my favorite parts of the job. In fact, it’s been a favorite part in all the different positions I’ve held here at NMPL, since I learn so much from you. However, I’m not out on the ‘floor’ as much as I used to be and I am missing the conversations and friendships. Please drop in and say hello! 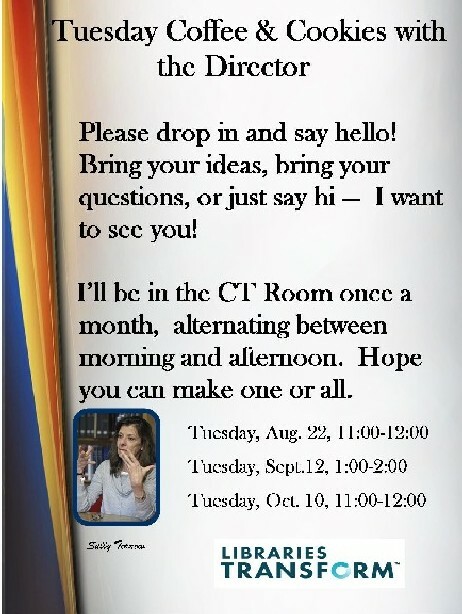 Bring your ideas, bring your questions, or just say hi – I want to see you!